Myanmar's Relief and Resettlement Department (RRD) under Ministry of Social Welfare and Asian Disaster Reduction Center (ADRC) have launched a program, Capacity Building of Local Government Officials on Disaster Management. This is one of the four capacity development programs for ASEAN countries that ADRC has been conducting since 2008, including disaster education promotion, utilization of satellite image on disaster management and development of Web-based GLIDE-associated database on natural hazards. 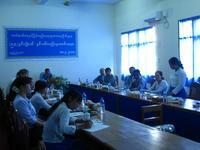 On 23-24 June 2010, RRD and ADRC held a kickoff meeting to discuss implementation of the program. Myanmar, which incurred devastating damages from 2008 Cyclone Nargis, is exposed to various disaster risks such as storms, floods, landslides, earthquakes, tsunami, droughts and fires. Thus it is of urgent need to further strengthen capacity of government officials in charge of disaster management. RRD and ADRC will cooperatively work for the implementation of the program, starting with setting up an expert team for training materials development.